Streaming video of the debate is now available from C-SPAN. MR. CAVETT: The fact is I don't have an opening monologue tonight because the subject of the show is quite serious, and I figured why make it more serious with one of my monologues, so I thought I would just start in. You know, I guess, who my two guests are tonight: John Kerry and John O'Neill, and they belong to Vietnam Veterans Against the War on the one hand and Vietnam Veterans for a Just Peace on the other. Both of them have been on my shows in the past. Not together, however. We did two shows a couple of weeks back on Vietnam veterans, and we picked a group of Vietnam veterans to talk about their various problems. This is a very touchy subject, as you know. The whole subject of this incites people to extreme feelings. We had an unprecedented amount of mail about those two shows. We really did. You always say unprecedented, but it was finally in this case. And all kinds of opinions, and just to show you a sampling of some of the reaction to that – it has something to do with how we've done tonight's show. There were other veterans who wrote in and said that it, of course, was not a useless battleground – is not. Another lady writes, "This war began as a political war and continues so today with our men not allowed to fight and not backed by the full power nuclear of the nation. The horror of this futile and therefore immoral effort was written in their words" – meaning the men who were here – "and on their faces these two nights. How more just it would have been to spotlight the real villains, McNamara, Gilpatrick, Rostow, et cetera, the whiz kids so aptly indicted by Lieutenant Kerry in testimony before the Fulbright committee." "Bravo. Thank you for showing both sides of the Vietnam picture from returned veterans, and thank you for balancing the program with the gung-ho sentiments of Sharp and O'Neill and the anti-war eloquence of Mueller" – it's actually Muller – "and Pickara" (phonetic spelling). Well, this indicates, obviously – I'm sorry everybody – not everybody, but a lot of people decided to take a political reaction to the show. We did not pick the fellows on that show to represent whether they were for or against Agnew, for example, or that sort of thing, but to hear their experiences. I would caution them that 90 minutes is not all that long. It's really closer to 70 minutes of actual air time, and a lot of applause goes – a little goes a long way, so I don't want to muzzle you, but be cautioned in that way. We will actually start, because it was requested that we do this – this may seem ludicrous – with the flip of a coin because – this is not going to follow the actual outlines of a debate, but I thought it might be well for each of you fellows to start out with some statement of what your organization wants and is, if you'd like to do that. MR. CAVETT: All right. It's an absolute – it's a U.S. quarter, 1966. You got it. When we were in Vietnam there were 87,000 marines in I-Corps. Today there are 900 in all of South Vietnam, and South Vietnam and I-Corps remain free. The unit we both served in in Vietnam, Coastal Division 11, the first naval combat unit in Vietnam, was one of the last naval combat units out of Vietnam last December. And the South Vietnamese who replaced us there are doing a fine job. They've won victories and they're suffered defeats as any army – as any army does. We've all heard of Lieutenant Calley. He's accused of the murder of 102 civilians in Son Mai Lai, and the operations – and the law will operate in his case. MR. CAVETT: Before that break – and I must apologize for the fact that we do have to keep stopping. It's a commercial medium, and sometimes those things aren't going to mesh very well. And I think that just as when your mother is drunk, you take her and dry her out – God forbid that she is – you take your country, in the words of Senator Carl Schurz, who said, "My country, right or wrong. When right, keep it right; when wrong, put it right." And I think that that's what we veterans are trying to do. You can contest this question of Vietnamization right down the line. The question really is this: Is the United States of America determined to leave Vietnam, and if we are determined to leave Vietnam – which I believe the president has shown some indications of because he has withdrawn troops. We don't deny that. What we say is the troops can be withdrawn faster. What we say is the killing can stop tomorrow, and it can stop if the president of the United States will set a date certain for the withdrawal for all United States combat and advisory troops from South Vietnam. And that's really the major issue. The effect of what you've done hasn't been to prevent one or two Kerrys (sic). It's been to label two and a half million of us as – Calleys, not Kerrys, although they may be somewhat interchangeable at times. That's precisely and exactly what you've done. And I think in honesty, as a just and decent human being, that you'd want to do that. I think there's something particularly pathetic about me having to appear on nationwide television and trade polished little phrases with you to defend the honor of the 55,000 people that died there, the two and a half million of us that served there. I think further that the justification that Hanoi uses for keeping our POWs is that they were engaged in criminal acts there, and I think that someone who comes out and says exactly the same thing could be doing nothing but serving those purposes, although I'm not – obviously those are not your intentions. There's no question about that. MR. KERRY: We – the Vietnam Veterans Against the War – and I can't even pretend to speak for all the Vietnam Veterans Against the War, let alone speak for all the men who served in Vietnam, and neither in fact can anybody else pretend to speak for a majority. That's entirely in the impossible range. But what we're saying is – and the reason that some of these men have not signed depositions is very, very simple, and it's up to each individual. One reason is that specifically they are not looking to implicate other people. They haven't cited names of individuals involved because they don't want more Calleys. They don't want men to enter double jeopardy, to have to come back to the United States of America and be penalized for those things that they did that were the result of the mistakes and the bad decisions of their leaders. It's interesting that you happen to say that you don't claim to speak for all veterans. You said that before the Senate Foreign Relations Committee, same testimony previously cited, "I'm here as one member of a group of a thousand, which is a very much – very – which is a small representation of a very much larger group of veterans in this country, and were it possible for all of them to sit here at this table, they would be here and have the same kind of testimony." MR. KERRY: Well, as to my being a liar, I – in my testimony before the Senate Foreign Relations Committee I did indeed say what he said. I said I represent one of the group of one thousand, which incidentally was one thousand at any one time. There were some two thousand who came through the whole time we were in Washington. And when I referred to the very much larger group within the country, I referred to our membership of our organization. I didn't say a majority; I didn't say all veterans; I said to a very much larger group, which is the some 20,000 members that we have in the country at this particular moment. And that was my reference there. As to this question of who speaks for the majority and all this personal vindictiveness, I really think that that's not what we're here to talk about. We're here to talk about the question of this war and why it is continuing, why – [unintelligible] – and I really don't think it does just justice to those men who have to give up their lives or be maimed or something or are in Vietnam now to have two veterans of the war sit here and go at each other's throats. I really think we can do better justice to the issue than that, and the issue really is why can't we set a date. Mr. O'Neill has simply shrugged this off, saying that would be absurd. MR. KERRY: May I quote his letter – no. Two days ago in Leonard Lyons in New York – as a matter of fact, in answer to a charge made by the Vice President of the United States saying a Robert Kennedy speech writer had written my speech, I would be flattered to have one write my speech frankly, but in this letter he wrote to the Vice President, saying, "Dear Mr. Vice President, Thank you very much for insinuating that I wrote John Kerry's speech. I would have been proud to have done it, but I didn't; however, in the future please be sure to mention my name as it will – as it is sure to help me in my next election." 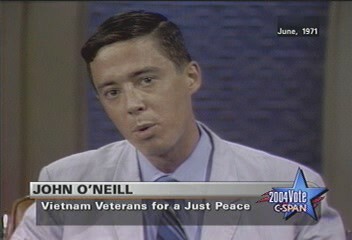 MR. O'NEILL: I think, John, if you'd poll the American people instead of taking 75 – poll the veterans in this country instead of taking 75 to Bunker Hill, and you asked them the question, "Do you consider yourself a war criminal," you'd find out that I was speaking for very close to two and a half million. 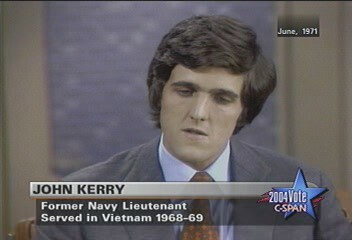 MR. KERRY: That's very, very interesting. I – you're speaking for most of the guys in your division and everything else? They feel this way, you think. MR. KERRY: I think – I really think that this is exactly the point that I am trying to make, and that is that we have never purported to represent any majority, nor can Mr. O'Neill sit here and pretend to talk for two and a half million. He can talk for himself. And I think that this contest is ludicrous, that the points to be discussed are the questions of the war, and that's the issue we should get to, and I'd like to talk about that in a rational discussion.